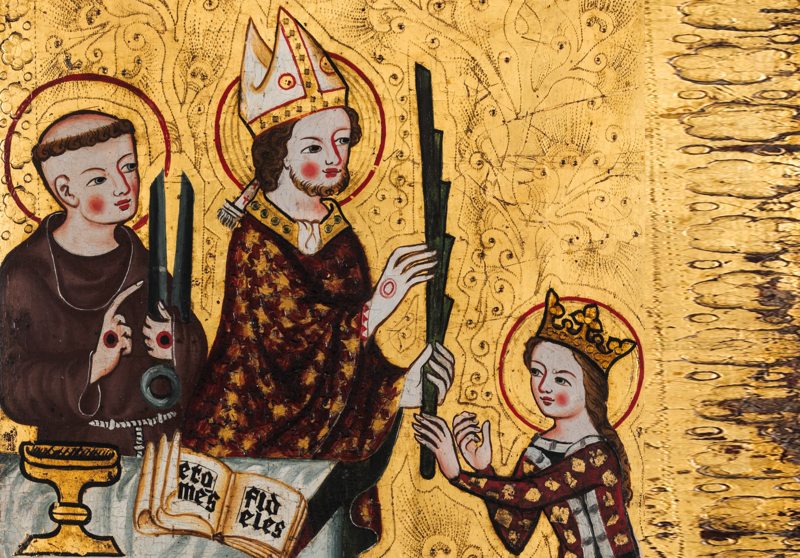 Detail of, "The Bishop of Assisi Giving a Palm to Saint Clare" ca. 1360 (Met Museum). I’m sure most of us have images of Palm Sunday from movies that we’ve seen. We imagine Jesus riding on a donkey as the people of Jerusalem wave palm branches and cheer, “Hosanna in the highest!” And, as the Gospels describe it, the events of the first Palm Sunday probably weren't too different from that. A few weeks ago I was on a pilgrimage to the Holy Land, and in Jerusalem you can trace the route that Jesus took, from the Mount of Olives, down into the Kidron Valley and then up to Jerusalem, through a city gate that they can still identify. But, for me, Palm Sunday is less about the scenes than about the spiritual message. That is, less about exteriors than about the interiors. Specifically, about how life can change so suddenly. One day Jesus is entering the holy city to the crowd’s cheers, a few days later he is being condemned by the crowds and nailed to a cross. It’s a sobering reminder of quickly our lives can change. It can be shocking when, all of a sudden, you have a change in fortune. You lose your job, get diagnosed with an illness, or suffer a death in your family. But Jesus understands what you’re going through, because he has gone through this himself. He understands you not only because he’s divine and knows all things but because he is human and experienced all things. During Holy Week, then, perhaps you could reflect on this essential truth: Jesus understands you. Thank you, Fr. Martin. A very timely message as there is much suffering in the Catholic Church.